I have quite a number of eye and cheek colors that are similar to this one by the Body Shop but I am so helplessly attracted to these colors that I simply could not resist. You see, it all came in a lovely, flip open, black, velvet box. See what I mean? So convenient for when you travel. So easy to slip in a purse. I am always drawn to colors such as these so for RM89.00, I picked this up as a present to myself just before Christmas. I used these colors on Christmas day and I must say I really liked the way it turned out. The colors are slightly shimmery without being overly so which really suits my skin. So, below are the swatches as promised. I am of the opinion though, that the Body Shop could have been a little more creative with the naming of these delicious colors.....the blush shade is just called, er, blush! Go figure! Could've done better. To glam up, I use Pink shimmer all over the lids, highlight the brow bone with Caramel shimmer and use a mixture of Plum and Chocolate shimmer in the crease to give depth to the eye. On the days I want to be casual or for the office, I use Pink shimmer all over and a little Caramel shimmer to highlight my browbone. There are some days when I prefer a low key look. If you are wondering if the sponge tip applicator that comes in the box is any good, well, it does serve its purpose decently. If you are travelling then no need to take a separate tool for application of the eye shadows. Sadly, no brush was provided for the blush though. Did the Body Shop expect me to use my fingers? This is another one of my purchases from Boots - Soap & Glory's Daily Radiance Moisture Lotion. I was intrigued by the cute packaging of the entire S & G line of products. Doesn't the lady on the box look so retro? Cuteness! The packaging in itself is a visual feast as it not only has attractive pictures, it also has a lot of interesting nuggets of information such as skincare tips to read. For instance, the top of the box reads "Is it risky to be this ravishing?" The reply? "Heck no, just Touch and Glow!" This is what it says on the back of the product under Soap & Glory Skincare Tip # 12. " Wear sunscreen on your face everyday, or in 20 years, you could be wearing it as a belt." Funny! So back to the moisture lotion that is supposed to make you glow. This lotion is a moisturizer with a built in bronzer in the form of little beads that pop to release the bronzing powder into the mixture. As you can see from the picture above, the bronze streaks have come from tiny bronzing beads that are contained in the lotion. This is more of a cream than a lotion because my idea of a lotion is one that has a thinner consistency. Once you rub the cream between your fingers for a couple of seconds, the beads break and you get a cream infused with a bronzer that should make your skin glow. The cream was easy to apply and not much effort went into getting the tiny beads to pop and release their bronzy goodness. Face is enhanced with a subtle glow. My face especially my t-zone became progressively oilier as the day went on and I found that I needed to use a tissue to dab off the oil more often. Did not provide ground shaking glowiness to the face - no one at the office said "Wow you're glowing today baby!" Bah! I find that in order to not walk around looking like a vat of oil threw up on my face, I need only to use very little of this product. 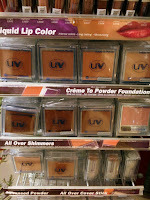 I spied a new brand of cosmetics called Uptown Visions whilst shopping at KLCC recently. It was a small display with mostly foundations, stick concealers, lipsticks and some nail varnish. They seemed to be reasonably priced too though I was in such a hurry, I did not get details of the prices of each item. 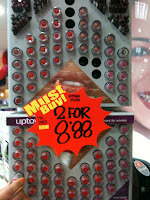 The lipsticks are currently 2 for RM8.88 - very auspicious especially during this Chinese New Year period! However, what interested me was the fact that a lot of the foundations were of darker colors than I was used to seeing! 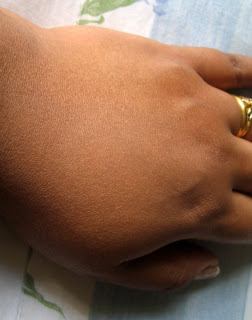 Good news for ladies of darker skin tones! Finally someone is taking notice of this oft forgotten group of women. It has always been my gripe that most make-up colours here in Malaysia is targeted at the fair skinned. Ladies of more 'exotic' colouring such as myself always find that we need to make do with whatever we can get our hands on because there just isn't anything specifically targeted for our colouring. I do faintly remember a brand called Jordana which I spied somewhere in the Bukit Bintang area about 10 years ago which carried colours that were targeted for African-American women and I purchased a blusher, I believe. However, I have not seen this brand ever since. I know because of lack of research, I may be missing the fact that some cosmetic brands have perhaps come up with a range that suits Indian or dusky skintones. Let me know if you have seen it! We are an ethnic group that is sidelined. What I would like these cosmetic giants to see is that we, like women of other ethnic backgrounds, love looking good and will pay good money to purchase skincare and makeup. I know I will. My peeve is being told off that a certain brand does not carry colours that suit Indian skin. I met an SA who had the nerve to tell me that "our brand caters to fair skin only". This is an insult to the brand itself. Hire half baked and ill informed SA's whose only ambition for being where she is, is for the cool uniform and free cosmetics and you have a recipe for disaster! In an article on beauty brands targeted at ethnic women, "newcomer Uptown Visions, are relying on face powders and foundations, as well as color cosmetics in a range of hues formulated for women of color, to cement a relationship with a wider range of ethnic consumers beyond just African-Americans." This is good news for my Indian sisters. I hope to get my hands on some of these products so I may review them for you dear readers. I am really fussy about foundations. They scare the living daylights out of me because I can never seem to find a color that suits my skin tone. I have one other foundation which is a M.A.C in NC 45 which really comes close but could be better. I also have a Maybelline Mineral Power powder foundation which I purchased in the US the color of which is Pure Beinge in a Medium 2. It is great if you want sheer coverage - too much powder foundation can have the overly powdered face effect which is every girl's nightmare. I have, of course, made horrible foundation mistakes in my younger days. Now I know and understand the benefits of blending! The thought of getting a color custom blended to suit my skin, however much it costs, has occurred to me but I have never gotten round to doing it. The area of foundations is one that I am still figuring out and I am sure with much trying I should be able to find something that I can say "Yes" to! What piqued my curiosity with this Boots No.7 foundation was the fact that it is called 'Intelligent Colour' - the SA told me that it adjusts to my skin color and the result should be smooth and sheer coverage which feels light on the skin. The colors available were light (01), medium (02) and dark (03)! Could not believe my eyes that there were actually colors for darker skinned women! I went straight for the medium and thought that would be a good match. The SA tried on some on the sides of my cheeks and it actually came out too dark. Surprise! She then suggested I go for the light and at this point I thought, "nah this is not going to work - the 'Light' would be too light". Not so. It turned out to be the perfect shade for me. This was my "Yes" moment indeed! This little tube was quite full of surprises. The texture of the liquid foundation was mousse like and spread like a velvety dream. It went on smoothly and did not cause any breakouts at all. What I really like about this foundation is that it does not weigh down my skin, if you know what I mean. Some foundations just feel heavy on your skin and makes you feel like washing it off as soon as you get home. Not this one. It felt good. This is what it says on the back of the tube:- ""Ever so clever colour... take away the guesswork with a foundation that adjusts to match the colour of your skin for a sheer, natural finish. Velvety soft, easily blended and so amazingly light you'll forget it's even there." I agree! See how well the colour blended into my skin! It also has an SPF value of 6 and is hypo-allergenic and does not block your pores. It cost THB599. That would be around RM62 - quite good value for money. So, dear readers, if you have access to Boots products and are looking for a foundation that has sheer coverage, why not try this one. This is another one of my purchases in Bangkok recently. I hit the Boots store and I hit it hard! And I went back and hit it again!! My husband thought I was crazy but hey, I got really excited looking at all the yummy products on display. Besides, we do not get Boots products here whereas our neighbours up north who are only a hop and a skip away do. Not fair! I am a bit of a Konad junkie and love as well as collect nail colors with a passion and I had read much about acetone free nail polish remover. However, I was never able to find this product here. Or perhaps I have not looked hard enough, so correct me if I am wrong ladies. The reasons for choosing a remover that is acetone free is the fact that it is deemed safer and is more gentler on the cuticles. Whereas a nail polsih remover with acetone actually dries out the nail bed and cuticles. There have been studies that link prolonged exposure to acetone to certain types of cancer. The key word here is "prolonged" and if you are a serious user of removers with acetone then perhaps there could be the danger of suffering from its after effects. Acetone-free removers are made from a milder solvent called ethyl acetate as you can see from the list of ingredients in the picture here. It surely smelt strong the first time I used it but as I kept going, the smell turned to something sweet, almost like a flowery smell but just much stronger. I told myself that I would not use it as often because the smell was rather off putting but gave this bottle a second chance another day. I discovered that it was not actually that bad a smell. I figured that the chemical smell was something that came out of the bottle the first time I opened it because subsequently it was not there. This is a fairly easy to use liquid which cleans as well as other popular brands. My favourite is Sally Hansen's remover but this does the job just as well. It costs around RM16. A little steep for my liking! I will stick with Sally Hansens for now. Sadly, once my bottles (yes, I bought two out of sheer "kiasu-ness") are used up I would not repurchase unless we get a Boots Pharmacy here! Keeping Your Skin Smooth The Natural Way. Have you considered using the stuff you would usually find in your kitchen as skincare? Last weekend was absolutely delicious because I got the chance to just laze about the house, which is rare because I am usually running around doing something or other! My mother is a firm believer in all things natural and this is a practice which she rigorously imparts on my children. Every Saturday, my girls take a bath with mung bean paste (or green bean which it is more commonly known as in this part of the world) which is rubbed onto their skin and washed off with soap and water. This leaves their skin baby soft and smooth and also, they enjoy pretending that the mung bean paste is some alien trying to invade their bodies! It's totally fun for them. According to mum, this is a practice that is commonly used to slough away dead skin cells and it is good for the body too because it is all natural. Besides, the recipe can be modified to suit your fancy. I too had a chance to take a bath using mung bean paste as a body scrub and I spent a considerable amount of time taking a slow leisurely bath. Allow me to share the recipe with you, dear readers so you too can try this when you have some time on your hands. You will need about 200 grammes of dry mung beans. Blend the mung beans in a dry blender until you get a fine powder like this. The longer you blend, the finer the powder. If you want the powder to be a little coarser which results in a coarser scrub, then by all means blend it to your liking. Once you are done, take the amount of powder needed and mix it with water until you get the consistency of a thick paste. The powder absorbs a lot of water so do keep adding until you are happy with how it is. It should not be too runny, which will then make it difficult to spread and scrub. You can use milk instead of water for a more luxe scrub as milk has softening properties in it too. My mum suggests using rose water which was traditionally used by her mother! But not many people have a bottle of rose water hanging around their kitchens do they? Once you get into the bathroom, apply this home made scrub on wet skin and scrub away concentrating on your elbows and knees. I even use this on my face and give it a gentle scrub. Once you are done, rinse the paste off your body and then continue with your normal routine of soap or body wash. The results? Totally smooth skin for a fraction of the cost! I purchased a tube of this lipstick from a cute little shop called Beauty Buffet at MBK Centre. The tagline states that it is the "most delicious beauty shop in town"! I loved the name and the concept - all the products are laid out like a buffet and you pick what you want and put it into a basket. One of the lines that they carry is called Gino McCray and I picked out a lipstick/gloss. This tube is slim and long and the color I chose is Cocoa. Here is a swatch of the color which is a warm brownish pink. It offers good coverage as a lipstick and has a glossy sheen that gives the lip a fuller look. It can be used on its own as a lipstick or over a lip color as a gloss. I usually use it on its own as it is not sheer and the coverage is more like that of a lipstick rather than gloss. It retails for about RM20 only. My only gripe with it is the doe foot applicator which does not reach all the way to the end of the product. I will have to devise a way to get to the bottom of it! So dear reader, have you had a look at the goodies on offer at the Beauty Buffet? I was in Brickfields the other day and popped into a costume jewellery shop. The reason I walked in was because I spied some Lakme products there. I have not seen the full range of Lakme cosmetics in KL (correct me if I am wrong here) but I have read some reviews and skulked around their website several times to know that they have some smashing stuff. Sadly the shop only carried ONE shade of blusher and several bottles of black liquid liner. Shame really as there is a whole lot more on the website http://www.lakmeindia.com/index.asp. I purchased the Pure Radiance Blusher in Rose. I liked the shade which I think really suits dusky Indian skin. Ladies with olive, dusky and darker tones don't really have it that good here in Malaysia. Most brands carry colors that complement lighter skin colors and thus leaving a really large group of women at a place where they have to make do. I am one of them. 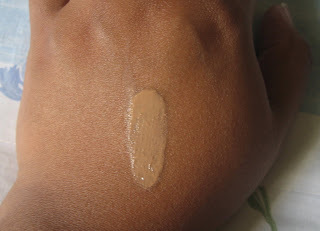 I have dusky skin with yellow undertones and many a time (years ago) when I used to shop for foundations, I was told right out by SA's of department store brands that they do not have colors to suit me! And I am on the fairer side of the spectrum mind you. Imagine my sisters with darker skin tones? Avon, a brand that was big in the 80's had shades which came close to fairer dusky skins but I don't see any brand until this day that specifically targets ladies with darker skin tones. I have seen cosmetic lines for women of African descent in the US such as Covergirl Queen Collection. Is there a line similar to this for Asian women of darker skins? Back to the blusher! This is what it looks like out of the packaging. It is a lovely cool shade of pink however, when you look at it closely, it is not that finely milled. But for the price of RM19.90 I believe it is good value for money. The brush, as with most blush brushes, is a not the correct size to add color evenly on your cheeks and this one is a little on the coarse side. I have swatched the color here for you to see. This is several rubs of the product as one swipe did not truly reflect the shade. I loved the color and it did give my skin a little radiance as the color enhanced my skintone. Whilst shopping at Chatuchak Market (or JJ market as the locals call it - seemingly its pronounced Jhatujhak or something similar). I stumbled upon several shops selling necklaces and I picked up a few for myself. The price and the make of these necklaces made it hard to resist. Firstly, I picked up the blue one and then fell in love with the red one (no surprises as red is my favourite color) and took the green for good measure! These necklaces were heavy unlike some similar one's I have come across and they were a bargain for less than RM25 each. I got a further discount because I took three!